A page for fish technology professionals around the world to recognise the contribution of Peter Howgate to our field. The International Association of Fish Inspectors is pleased to announce the opening of applications for the 2017 Peter Howgate Award. This award will fund the attendance of a young fish technologist (under 30 years of age) to the IAFI World Seafood Congress 2017, to be held in Reykjavik, Iceland, from 10-13th September 2017. 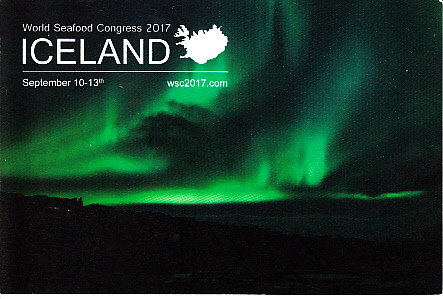 The Congress will be hosted by MATIS, the Icelandic Food and Biotech R&D institute, and will also coincide with the Icelandic Fisheries Exhibition and Awards from 13-15th September. The Award will cover travel, accommodation and the congress fee. This affords the successful applicant a career-changing opportunity to gain new insights and build networks in the global fishery sector. The deadline for submission of applications is 31st March 2017. Download the detailed rules and application form here. For 35 years, Peter Howgate worked at the Torry Research Station, Aberdeen, UK a government institute specialising in research and development in fish processing and handling. Whilst at Torry Research Station (and also in retirement) he authored or co-authored numerous papers in refereed scientific journals and he has contributed chapters to numerous books. Many of Peter’s major contributions were made when he became Head of the Quality Assessment Unit at Torry, and developed the pioneering work on sensory assessment of fish instigated earlier at Torry by Shewan and Erhnberg. The work embraced chemical and sensory methods of quality assessment and had major implications in both the scientific and commercial fields. Without a doubt, Peter became our leading expert in the sensory assessment of fish quality, and over the years he has made massive contribution to our understanding of fish spoilage. During his time at Torry he was an active participant in WEFTA meetings and also, in 1978/79 spent 18 months attached to the fishery products laboratory in Malaysia. Peter retired at the end of 1989 and was recognised with the “Most Excellent Order of the British Empire” awarded by Queen Elizabeth II. Torry was closed in 1996 and the residue of its functions dispersed to other government departments. But Peter has continued to work hard to preserve its legacy. Peter carried out many consultancies, working for UN agencies in Africa, South America, and the Far East. He managed to salvage a good part of the Torry library, subsequently donated to the Humberside Seafood Institute, and most recently he created FishTechDB an online bibliographical database of topics related to fish technology. The database is now available as a public service to the global seafood community via Seafood Network Information Centre. Between 1996 and 2002, Peter was also deputy editor of the International Journal of Food Science and Technology. Peter continued to generously give his time to replying to enquiries on aspects of the science of fish as food. He was an active and regular contributor to the Seafood email discussion list. Peter died on 24th December 2016 and this award keeps alive the memory of his incredible lifetime of contribution to fish technology.